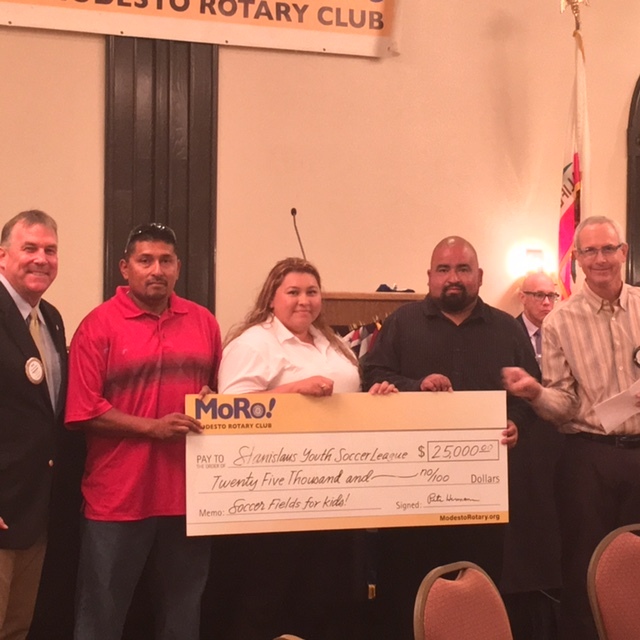 The Modesto Rotary Club donated $25,000 to the Stanislaus Youth Soccer League to help with the construction of a 14-acre complex to serve children and adults in west and south Modesto. The check was presented Tuesday at the club’s weekly meeting to three officials from the soccer organization, which has broken ground at the site near Bellenita Park in west Modesto. Plans are for the fields to be used by more than 1,200 children as well as adult leagues. The goal is to open the complex by April 2017. Jesus Perez and Angela Hernandez. With more than 250 members, MoRo is among the largest Rotary clubs on the West Coast. Since its founding in 1920, Modesto Rotary has been committed to improving the world. Local projects have included scholarships and other education initiatives, work with other service clubs on the Virginia Corridor bike and walking trail, and support for the Miracle League of Stanislaus County baseball league for disabled children. Rotary International is a global organization of business and professional leaders who provide humanitarian service, encourage high ethical standards in all vocations, and help build goodwill and peace in the world. Approximately 1.2 million Rotarians belong to more than 30,000 Rotary clubs in more than 160 countries. Rotary club membership represents a cross-section of the community’s business and professional men and women.